In fact, we ran one of the most high profile meetings within the sporting federation sector that our system has ever been involved in. The historic and high profile nature of the meeting only added to the highly-contested and sensitive moment in this sporting federations calendar. At the event, our technology excelled itself, particularly when it came to some of the more complex votes, and where there were multiple rounds of voting that resulted in some candidates being eliminated until a winner was selected. The meeting organizers kept on informing us that without the technology, they would literally have been there for days - a real endorsement for the benefits of using Lumi software. 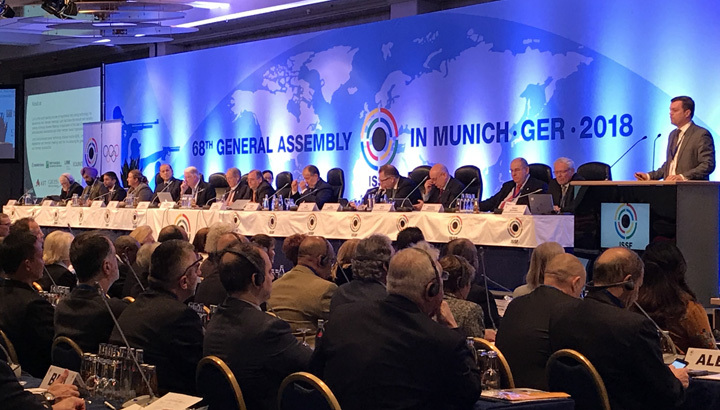 As well as Mexico’s Olegario Vázquez Raña standing down as president after 38 years in the post, secretary general Franz Schreiber, who had worked for the Federation for more than 30 years, also stepped down. And at the same time as the changing of the guard in the top two positions in the Federation, the meeting also had to hold 20 other votes for a range of other posts. The presidential election itself was a highly charged affair with 2 candidates standing, and the outgoing president knew the Federation needed a system that could stand up to any amount of scrutiny. It was a momentous and highly sensitive occasion for the ISSF under a great deal of public scrutiny. Speed, accuracy and security – as well as voter anonymity – were key. Our technology support was vital in validating the voting, creating the transparency to give everyone confidence in the outcome. One of the Federation’s biggest concerns was that voting should be conducted by secret ballot and being anonymous whilst complying with the strict requirements from the multiple elected scrutineers. Through our experience with other sporting federations with similar needs, our unique voting solution enabled this anonymity without compromising the integral security and required accuracy demanded of our solution. We were anticipating that the first vote would be the election of the new president, however, on a prior separate matter, a show-of-hands vote was rejected and we were suddenly asked to provide an ad-hoc electronic vote at extremely short notice. We were able to create the required motion in the software and distribute the hardware to run the vote very quickly and reliably. That helped to put members at ease when it came to the vital President’s vote. We had already had to deal with the withdrawal from the race of a candidate but we were able to remove the candidates name instantly from the ballot. If it had been a paper vote, ballot papers would have need to be reprinted at considerable expense of time and money. Another challenge was that there were more votes in the room than people, member federations were able to proxy their votes to other federation representatives. In a show of hands situation, this would have been incredibly time consuming and a real task for the appointed scrutineers. In the event, the Presidential vote was, as anticipated, very close, with the new president elected by just 4 votes. The election of the General Secretary was more complicated, but also conducted very smoothly. Six candidates vying for one position with the winner having to secure 50% + 1 of the valid votes in the room. The Federation then held a vote for its numerous Administrative Council positions. The sheer scale and level of complexity involved in the running of this vote proved to be one of the more challenging with several criteria needing to be met. 39 candidates competed for 15 positions, with members able to vote at any 1 time for up to 15 people from the list. It took seven rounds of voting to elect the entire Administrative Council. We had to take account of which candidates dropped off or withdrew after each round – without our software and the flexibility it provides us, it simply would not have been feasible. There was minimal let up on the third day of voting - the election of the Federation’s 30-member board, had to take into account new legislation that stated at least one member of the committee had to be female. Our software helped to avoid any controversy, provide confidence and ensure that the congress came to a conclusion well within the allotted time. All in all, it was a monumental moment for the ISSF to switch over to electronic voting at one of the most important meetings in its history. The process was closely watched in the sporting federation world, and it was vital for the ISSF that the meeting was a success. We delivered on the faith they placed in us and the meeting ended with a very happy membership and a very happy sporting federation.